This post is being featured in travel clothing company SCOTTEVEST/ SeV’s weekly Pocket Guide newsletter. While planning a visit to Custer State Park, I knew that it had a pretty large herd of bison along with many other animals. I was curious as to what other animals called the park home. I found out that a small donkey called burros also lived there. Initially you might think- Who cares? I didn’t fly from NYC to South Dakota to see some donkeys in a park. However, these burros are wild, living freely in the park and are also very friendly. The burros are friendly because they are always on the lookout for a free meal! I read that you can feed and interact with them but to be careful as they still are wild animals. Our first stop at Custer was early on the second evening of our trip. I was on the lookout for burros and finally came across two standing around in a field. I expected them to come over to the car but they showed little interest. I decided to lower the window and wave my arm outside while holding an apple. This did the trick! One of the burros came over slowly followed by the second one. I have to admit that I was a bit of a wimp at first. I was debating whether or not to get out of the car and decided against it. I had the window half down and was feeding the burros apples through it. This was not the best idea as the apples kept falling back into the car. Once the burros got a hold of the apples, they would bite them in half, squirting apple chunks and juice all over the car. They then went on to lick the car and window (seemed like a free car wash at first) making a mess and making it very hard to see out of the window! The following morning we returned to Custer. I came better prepared this time. While at breakfast, Kim ordered pancakes. They were huge, practically the size of hubcaps. She ate one of them and I figured that I should bring the leftovers for the burros. I asked the waiter to wrap them up and told him what they were for. I think he thought I was joking since I had to remind him to wrap them a second time. After driving for a while in the park, we came across a large group of burros. They were in the same spot as the previous day. There were lots of mommy’s with their calves. Some were lying down and relaxing, others were friendly and came up to any vehicle that pulled over. Most of the burros were pretty calm and laid back while a few were a bit on the aggressive side. Each vehicle that pulled up was a potential meal and they wanted to be fed! I started off by breaking out the pancakes. I figured the burros would like them from a conversation that I had with a park ranger at Mount Rushmore. The ranger had told me how it was OK to feed the burros and that we should feed them healthy food. If the ranger was telling me to feed them healthy food I figured they must love junky food! Once the pancake container came out, I was surrounded by a bunch of burros. One of the burros was aggressive towards the others so I had to try to shoo him away to share some pancakes with the others! Asides from the pancakes, I also had some apples that I bought the previous day. They seem to be the choice snack option that most people bring to feed the burros. We ended up spending about 45 minutes feeding and playing with the burros. It was a memorable experience that ranks up there with other animal interactions that we’ve had in the past. 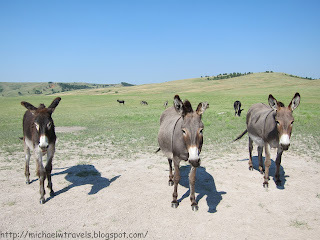 I was surprised at how much fun we had hanging with the burros in Custer State Park! Too funny! The burros at Custer State Park are like the park mascots. They are always welcoming visitors with a cheerful greeting. So glad that you were able to spend some time interacting with them – and yes, they are always good for a “free window wash.” That is, if you can see out of it once you’re done visiting with them! Funny guys. I told you that we like animals! Michael, calves?? You’re thinking cows. A burro’s young is a foal. If male, it’s a colt, and if female, a filly. Same as in horses. Other than than, very nice review! — Rich A. Thanks for the correction. I should’ve known better but instinct said they are calves. I had some words with my editor (my wife) about not catching the error! Glad you liked the post otherwise! Looks like your window tasted good-love the article! What was the name of the cafe with the hubcap sized pancakes? Traci- It was next door to where we stayed, the Black Hills Mile-Hi Motel. I can’t recall the restaurant’s name but I checked Google Maps and (unless the name changed) it is called the Wrangler Cafe. What was the cafe’s name,with the big pancakes?